Adapter kit for 1/2", 3/4", & 1" base openings. Has 8" harp, harp base, U.L. listed brass plated socket, 8 ft. cord set and all of the necessary hardware to convert a bottle to a lamp. 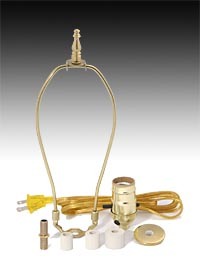 No reviews yet for the Jug or Bottle Lamp Adaptor Kit with Harp & Finial.